GT 01 RAPIDFLO™ is a rotary action fuel and oil pump for 205L drums and is supplied with 2-piece suction tube, pump handle, 2" bung adaptor, 2.4m anti-static delivery hose and nozzle tube. Typical output is easily up to 100L/min depending on viscosity. Rotary pumps allow delivery in both directions and are typically easy to prime. (* Users of aviation fuels must check material compatibility with fuel product they are using). GT01 BD RAPIDFLO™ Bio-Diesel model is a rotary action fuel and oil pump for 205L drums. 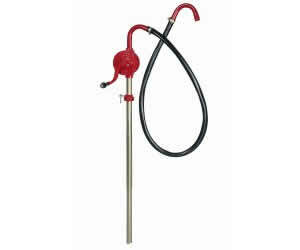 It is supplied with 2-piece suction tube, pump handle, 2" bung adaptor, 2.4m anti-static delivery hose and nozzle tube. Suitable for bio-diesel, kerosene and light oils up to SAE 30 viscosity. Rotary pumps allow delivery in both directions and are typically easy to prime. Suits 205 ltr drums and can deliver up to 40 L/min via an easy rowing action. Includes 2.4m anti-static hose & ULP/diesel nozzle with an in-built nozzle holder prevents siphoning. An economical rotary pump designed to dispense diesel, kerosene and lubricating oils up to 20 L (5 US gal) per minute from 60 L (16 US gal) to 205 L (55 US gal) drums . High Flow Rotary Bi-Lobe Pump also offers delivery in both directions and easy self-priming feature. 100 L/min. 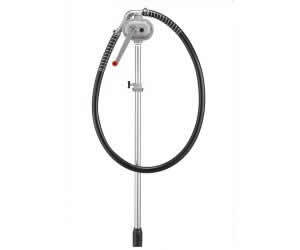 Complete with 2 piece suction tube and strainer, 2m delivery hose, delivery nozzle and nozzle holder. Polyethylene Heavy Duty Siphon pump for use with water based fluids, detergents, waxes, soaps, antifreeze etc. For use with 205L drums. Rotary Hand Pump with 1" Inlet. Aluminium Construction, dual directional operation. Complete with 2" bung nut & 3 piece suction tube for use on 60 - 205L drums. Rotary Hand Pump with 1"" Inlet. Heavy Duty Cast Iron Construction, dual directional operation. Complete with 2"" bung nut & 3 piece suction tube for use on 60 - 205L drums.